Today, when the Holy Church commemorates the memory of the Holy Apostle James, Brother of the Lord in the flesh, as has been customary in the monastery, the Liturgy of the Apostle James was concelebrated by the monastery clergy. This ancient liturgy, which was the basis of the liturgies of St. John Chrysostom and St. Basil the Great, impresses one with its great prayerfulness and a connection with the Old Testament. Being a Sunday, our pilgrims were able to take advantage of participating in this liturgy and to be impressed with the richness of the Orthodox liturgical tradition. The Liturgy of the Apostle James has only been served in the Russian Church since the 1930’s, and more specifically in the Russian Church Abroad, after the church musicologist, Philip Gardiner, translated the service into Church Slavonic. It is interesting to note that the service book was printed in the mother house of our monastery in Ladomirovo, Slovakia. 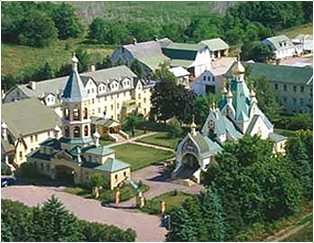 It also might be pointed out that the last few years, the monastery also serves during Great Lent the Presanctified Liturgy of St. James as well as the Liturgy of the Apostle and Evangelist Mark.